Salfordian comedian and actor Jason Manford (actually born in Irlam O'Th' Heights), brought most of his family along with him this evening to support his latest venture, and a sideways departure from his more well-known persona as a stand-up comedian or Musical Theatre actor. This was a solo concert of a very different nature as he has recorded an album and is now on the road singing songs from it, trying to promote it and showing fans, both old and new, that he has something more to offer. I saw Chitty Chitty Bang Bang at The Lowry about this time last year with Manford playing the lead role of Caractacus Potts, and I loved his easy manner and stage presence, but I had, until now, never seen him as a solo entertainer. He came across as very genuine and down-to-earth; totally un-starry, and he seemed genuinely pleased and surprised to see an almost capacity audience in the Lowry's main Lyric Theatre stage. Immensely likeable, you warmed to him immediately and he certainly has that certain je ne sais quoi which one needs as a solo artiste. He showed great compassion and love of all his family, even dedicating certain songs to them as he went along; and the majority of his in-between-song banter concerned his family. The stage itself, the largest proscenium arch theatre in Europe, was set with a string quartet, bass / acoustic guitarist and pianist which accompanied him throughout to a greater or lesser degree of success. 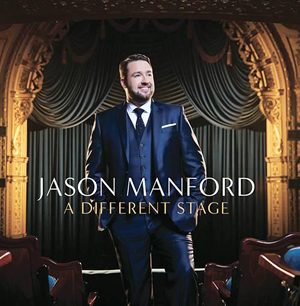 I didn't like some of the arrangements at all, suiting neither the instruments nor Manford, and a 6-piece string section was insufficient to complement Manford's sonorous low voice and his too open and wild high voice. Actually, Manford was at his best and most comfortable when he was crooning. Some of the songs he had chosen most unfortunately didn't particularly suit him and his vocal quality at this stage. The higher and louder he sang, he became somewhat off-key singing an approximation of the note rather than hitting the note fairly and squarely on it's head. If he learns to cover and focus the voice more in the higher registers, then his voice would improve a thousand fold. Sorry, Mr Manford, I don't mean to be too critical, since your set was extremely enjoyable and you do have a lovely voice and put great passion and emotion behind every song. It is obvious you have thought a lot about which songs to sing and indeed how to interpret them, and your love for the songs and the reasons behind them was lovely. The best song of the evening for me was a cover of Perry Como's 'It's Impossible', with a close second being 'Hushabye Mountain' from the aforementioned Chitty Chitty Bang Bang. It was also "truly scrumptuous" to see that three of the young children who had starred with him in the run at The Lowry had come this evening to support him, and so he invited the three back on stage tonight to sing the Musical's theme song with him. A genuinely lovely touch. His support singer was Tiffany Grace, with whom he starred in Mel Brooks' The Producers, and he sang a duet with her from that this evening. Grace's one solo was the song Petula Clarke made famous, Downtown. Together they sang one of my all-time favourite comedy songs, a parody of itself, The Song That Goes Like This, from Spamalot; and the most interesting song of the evening has to go to a song that I heard, as far as I can remember, for the first time this evening; an Irish song, with verses written by Peter O'Toole, called Carrickfergus. And although I believe that Manford isn't really quite ready yet for the big power ballads (he did several this evening), his second encore was a great song and fabulous way to finish as you could hear and see Manford both visually and vocally lift and improve once there was an orchestral backing track to support him. It was the brilliant Shirley Bassey ballad, 'This Is My Life'. In short, a wonderfully entertaining and personable showman, who obviously has a great passion for singing and the songs he sings. A very enjoyable evening.